Moist to wet. Swamps, woods, streambanks. 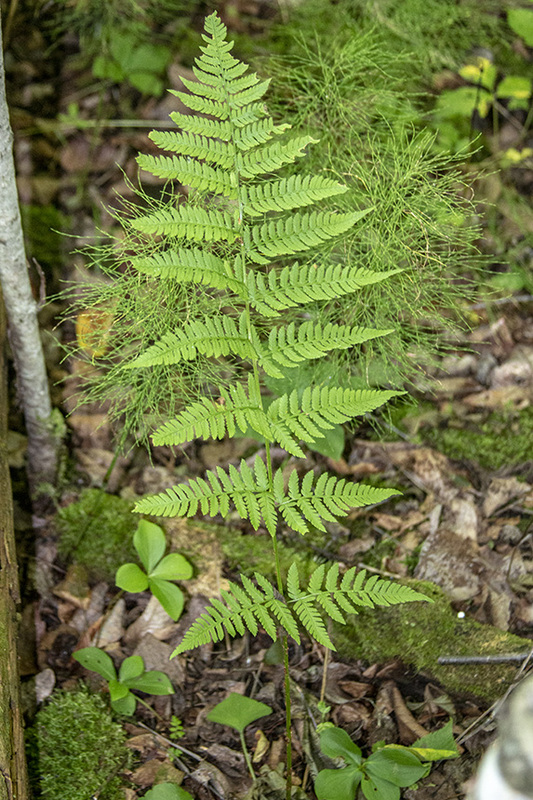 This is a relatively large, delicate, perennial fern that rises from a short-creeping rhizome and fibrous roots. The rhizome is thick, coarse, erect, and scaly. It often forms clumps. 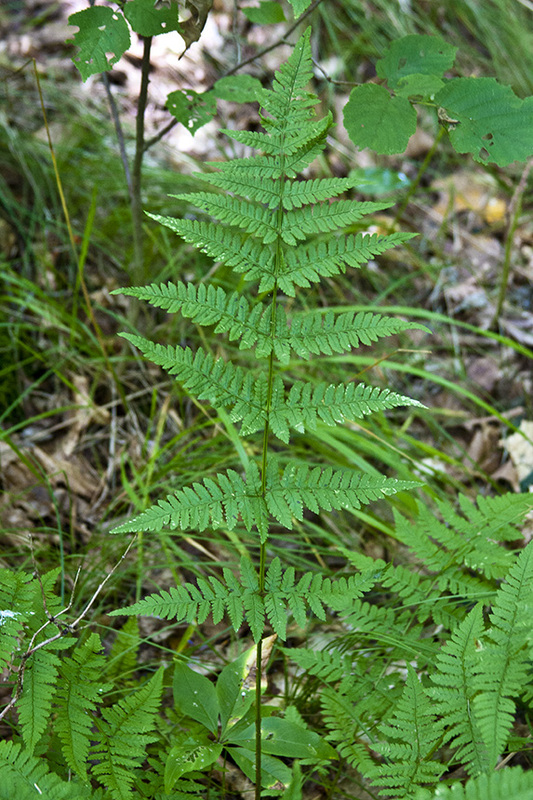 Sterile and fertile fronds are similar in appearance. 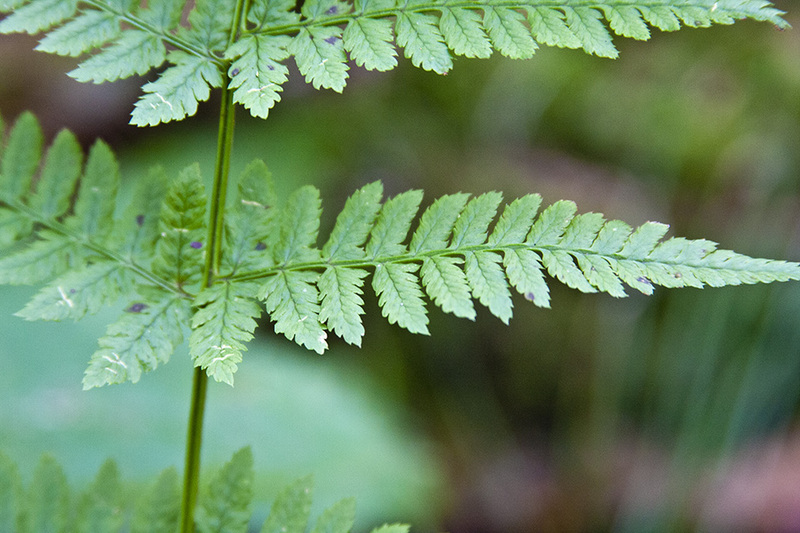 The fronds are erect, arching, 6″ to 30″ long, 4″ to 12″ wide, and lacy in appearance. They are about 2 times longer than wide, and most are at least 16″ long. They are deciduous, dying back in the winter. The leaf stem (stipe) is stout and 2″ to 12″ long, ¼ to ⅓ the length of the leafy portion (blade). Near the base it is densely covered with tan, chaffy scales. There are scattered scales on the middle and upper portions. The blade is narrowly oval to narrowly triangular, and often light green to yellowish-green. It is pinnately divided into 10 to 15 pairs of leaflets (pinnae). The blade is about the same width from the base to the middle. The upper half tapers to a point with concave sides along the tip. The lowest pair of pinna are not angled downward. The central axis of the blade (rachis) is pale green. It does not have glandular hairs. The pinnae are oblong lance-shaped, short stalked or stalkless, and taper to a narrow point with concave sides along the tip. They are deeply, pinnately divided. They are often angled upward and are arranged more or less parallel to the plane of the blade. The lowest pair of pinnae are lance shaped to elongated triangular, narrowing rapidly from the base, and are often slightly shorter than the adjacent pair. The pinnules are lobed. The basal pair of pinnules, closest to the rachis, is the longest and is deeply lobed, cut up to halfway or more to the midrib (costule). They become smaller and less deeply cut as they ascend the costa. The inner pinnule of the lowest pair, the one pointing toward the base, is longer than the opposing one, the one pointing toward the apex. The veins visible on the underside are forked. They are free, meaning they do not rejoin. They do not extend all the way to the margin of the pinnule. The margins are finely toothed. The teeth have a spiny tip that often curves toward the tip of the pinnule. The reproductive structures are born on the underside of the pinnules. There are numerous, round clusters (sora) of spore-bearing cases (sporangia) arranged on each side of the midrib halfway between the midrib and the margin. It is covered with a protective veil (indusium). The indusium is kidney-shaped, clearly visible, and attached to the pinnule at the inner curve. 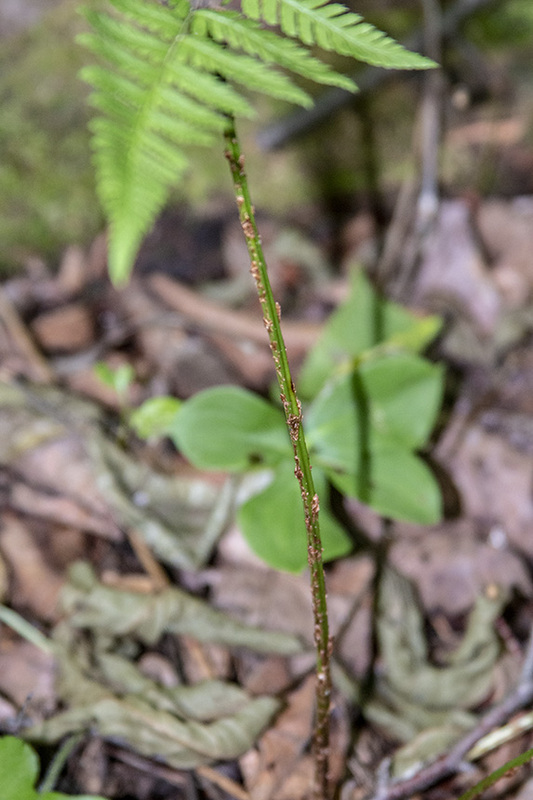 There are no glands on the indusium. 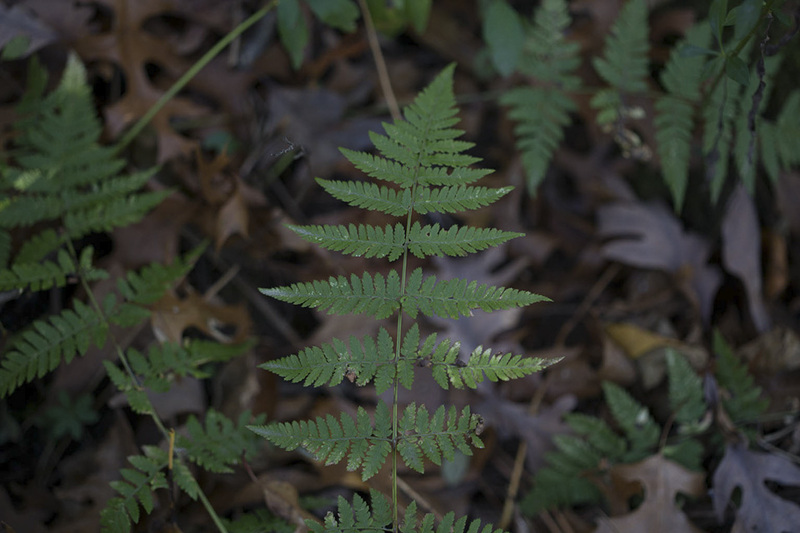 Common wood fern (Dryopteris intermedia) is evergreen—the fronds remain green throughout winter. It has gland-tipped hairs on the rachis, costa, and indusia. The lower pinnule closest to the midrib is shorter than the one adjacent to it on the same side. On the basal pinnae the lower pinnule closest to the midrib is longer but less than twice as long as the one opposite to it. The ultimate segments (pinnule lobes) are more deeply dissected, appearing lacy. It is much rarer in Minnesota, occurring only in the easternmost counties. Sources: 2, 3, 4, 5, 7, 24, 28. Щитовник шартрский - Dryopteris carthusiana. La Dryoptéride spinuleuse du printemps à l'automne. 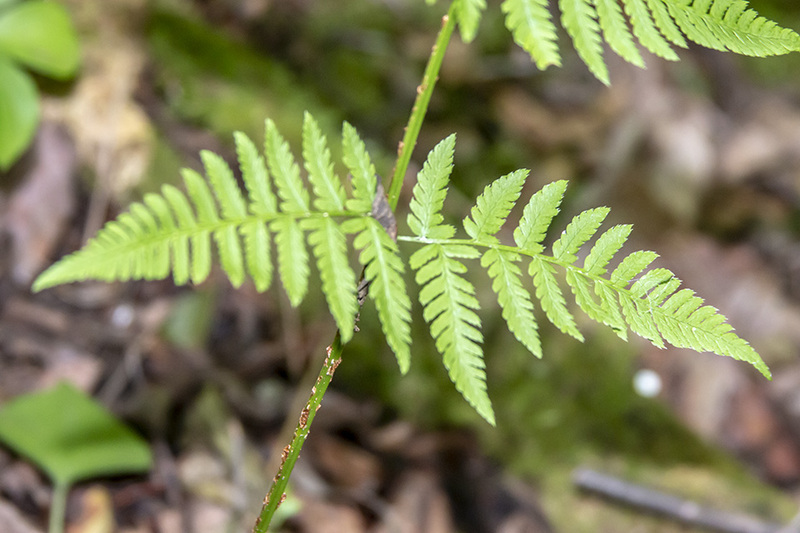 Spinulose Shield Fern from spring to fall. 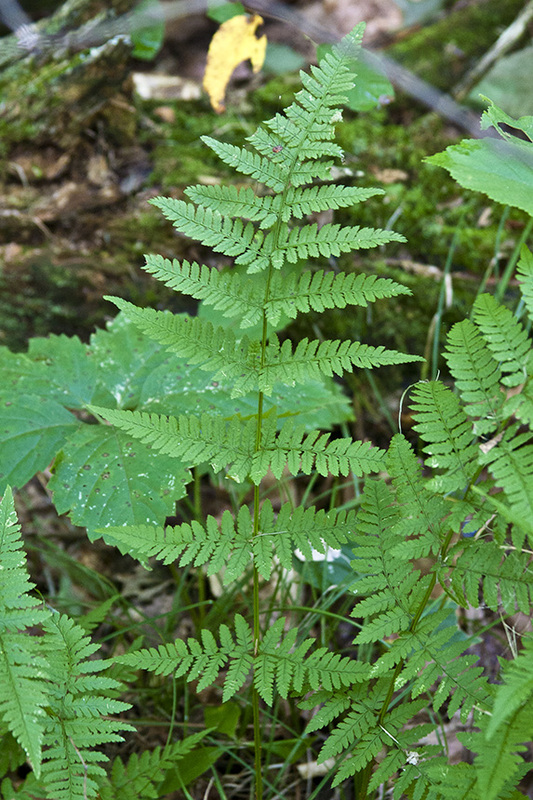 Helecho Dryopteris carthusiana de la primavera hasta el otoño.